This is one of those books that I picked up on a whim really. I'd heard it mentioned on a blog somewhere, but otherwise knew nothing, and I suppose it appealed to the part of me that likes to learn about other cultures, considering the obvious Indian viewpoint. So I went into this completely blind, and more than a little tired out from How the Dead Live as well as more essays than I could count. I think this was the change of pace that I needed. 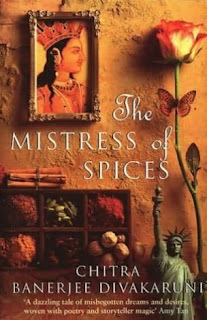 The Mistress of Spices follows an Indian woman named Tilo who runs a spice shop in California. On the surface, she's a normal old woman, if unusually observant. What her customers don't know is that she is the eponymous Mistress of Spices, which means that she can communicate with the different spices in her shop and use their latent mystical properties to help the Indian immigrants who visit her shop. There are, however, certain rules that Tilo must follow in order to stay in the spices' favour and thus keep her powers, such as staying impartial, dispensing wisdom and help equally to those who enter the shop; this rule in particular is broken as the novel progresses, as she gets intimately involved in the lives of several of her customers, especially that of an enigmatic American who arouses in her the most forbidden of feelings for a Spice Mistress: love. I will just state this so that it's out of the way. I love the use of spices as a medium for magic ability. It creates a sense of structure that tends to be missing in a lot of books involving magical realism. Pretty much every event in the book can be traced back to a moment in which Tilo made use of particular spices. The outcomes can usually be traced to how the spices consider Tilo at any one moment too: while most of her spells at the beginning go pretty much as expected, the more rules she breaks and the more emotionally invested she is, the higher the likelihood is that they will backfire on her in some way, particularly if she has to actively impose her will on to the spices. I think that the fact that the spices could be considered this kind of multi-headed/hive mind character makes the magic system really interesting and different. In terms of characters, this is an ensemble cast, so even if you don't like one character, there's bound to be maybe two or three others that you do like in their place. The only ones who get any real in-depth characterisation though are Tilo and the American (whose name you do find out, but I shan't spoil it for you). With Tilo, the reader gets the majority of her backstory in the first few chapters, covering her journey from her home village, where she was lauded as a mystic and feared by the rest of her family, to her life in the guise of an old woman in California. The American's past is more drawn out in comparison, as he decides to tell Tilo about his life through several different meetings. Both are fairly sympathetic, yet incredibly flawed people, and their attraction to one another is, if a little odd when you consider them as a couple from a more objective viewpoint, very sweet and with good chemistry.